Arriving in our warehouse 9/19/06. Check our feedback rating and order with confidence. 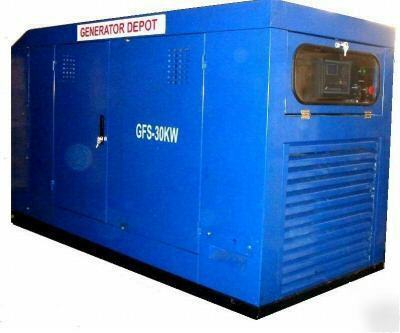 Whether you are looking for backup power for emergencies or need to power an off-grid cabin, this generator set is for you. This unit combines the rugged and dependable œST style 1800 rpm generator head with a bullet proof diesel engine. This unit is designed to last for years and to be easily repairable in the field with basic tools. It is built to ISO2000 quality control specifications. You can even run this unit on new or waste veggie oil (WVO) with some slight adaptations to pre-warm the fuel. Designed to be reliable by using the œKeep It Simple principle. This is not your typical consumer generator head that screams along at 3600 rpm. The ST units run at a comfortable 1800 rpm. This fact alone accounts for a huge increase in service life. I have read several accounts of these generator heads supplying power for irrigation pumps in West Texas that have been in service for 30 years or more, many running 24/7. Don™t try that with a consumer generator designed to last 1000 hours (42 days), if you are very lucky! The ST head has a cast iron housing with large ball bearings supporting the rotor at each end. The bearing will last many years, but can be easily replaced with off the shelf bearings available at any bearing supply house. The integral cooling fan is made of metal, unlike the fragile plastic fans found in most generator heads. What about brushes? We use a brush type head on all of our generators. This is due to years of experience with both brushless and brush type designs. Brushes last a long time, have an indefinite shelf life and are changeable in just a few minutes. The brushes carry a very small amount of power used to excite the armature. They are not carrying the output power from the generator. Don™t confuse these with the short life brushes on your large induction motor chop saw. Not the same thing at all! The brushless design has the excitation electronics riding on the rotor. These parts are subject to extreme G-forces and vibration. They are more likely to fail than brushes, and are very difficult to repair. This is why the automotive industries have stuck with the brush design on auto alternators for the last 50 years. For more information, do a Google search on œST Generator Head. You will be sold on this design. Cooling “ This unit uses a closed circuit water filled radiator design similar to that found in a diesel truck. 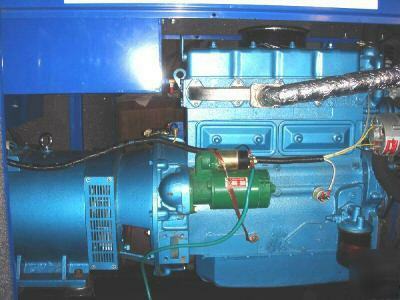 The radiator is mounted on the generator frame, not the engine, to isolate it from engine vibrations. It is a very elegant design. The engine is a Chinese built clone of a Cummins diesel. Any diesel mechanic will be familiar with this design. It is in used throughout the world in literally millions of applications. 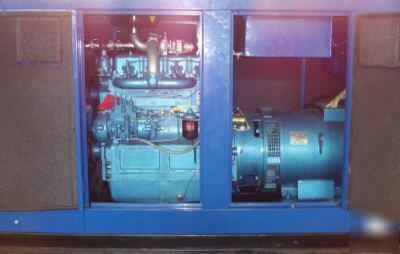 A safety system is built into the generator set that will automatically shut down the engine if it senses WATER OVER TEMPERATURE , OIL OVER TEMPERATURE , LOW OIL PRESSURE or RPM OVER SPEED . The silencing cabinet is very effective. It is completely lined with fireproof foam sound deadening material. Look at the picture with the access door open and you will see the grey foam I am talking about attached to the inside of the door. The entire inside of the cabinet is lined with this material. In addition, this engine is equipped with a large muffler. This unit will not drive your neighbors crazy. 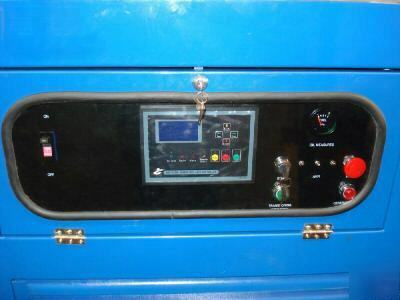 All units are equipped with a tank capable for running the unit for about 8 hours at 100% capacity. This unit will burn approximately .08 gallons of fuel per hour for each kilowatt of power output produced. Running a 50% load will increase run time to about 16 hours. If you need more run time, it is quite easy to attach a larger external tank. We can supply 3rd party tanks of up to 1500 gallons in capacity. This engine is manufactured by multiple entities for multiple products and users. 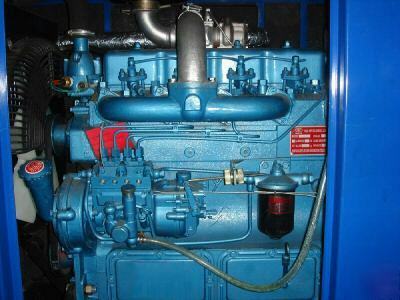 If you do a Google search on +4100D +diesel, you will find numerous sites that mention this engine. When I tried it, I found 572 sites. Parts are available from many sources. Same story for the ST type generator heads. Of course, we can also provide parts. Note: Installation by a qualified electrician required. Not responsible for damage or injury caused improper operation or installation. Local pick up is O.K. Call first to make arrangements at . We also have the other sizes and styles listed in the specifications table arriving at the same time. Order now to reserve yours. Warranty: 1 year or 1000 hours. Parts only.